If you're missing part of an audiobook, it's likely that it didn't transfer properly to your iPod. To resolve the problem, please follow the steps below. Plug your device into your computer and open iTunes (if it doesn't open automatically). Find the audiobook you've transferred to your iPod. 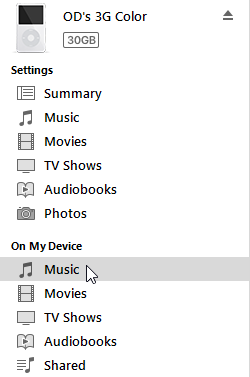 For most iPods, they're stored in Music in the left-hand pane (under "On My Device"). For iPod shuffles, they're stored in On this iPod (under "Settings"). Audiobook parts that didn't transfer properly will be grayed out in iTunes. Click on a grayed-out part and press the Delete key on your keyboard. Re-transfer the audiobook part(s) you removed in step 4 using OverDrive for Windows. Once the transfer is complete, return to iTunes and make sure your newly transferred audiobook parts aren't grayed out. Once you're done, click the eject button next to your device's name so you can safely unplug it.